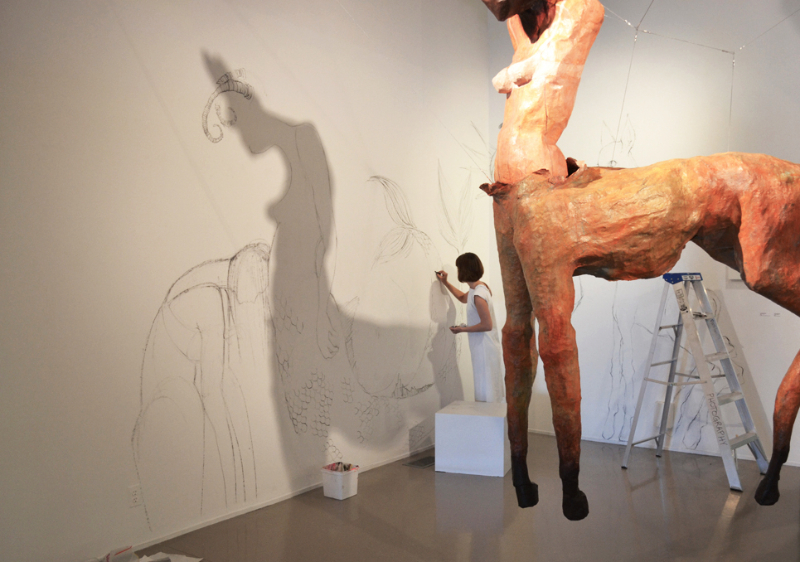 Aleks Bartosik is a Toronto based artist who works figuratively and most oftern large-scale. Her main mediums are painting and drawing, however, Bartosik’s practise also expands to performances, installations, and video/film animation. Exploring the boundaries between the real and the imaginary, she investigate one’s ability and willingness to imagine, pretend, dream and suspend disbelief, most often involving the viewer directly with her installations. Interested in our repressed fears and the sense of wonder engendered through curiosity and dream, she experiments with different disciplines, surfaces, and spaces that invite the viewer to wander the realms and playgrounds she creates, as her paintings and sculptural installations transform. If you are not afraid of the dark, I would like to take you by the hand and lead you into my maze of pictorial creations that will take you to places you never been and show you things you never seen. 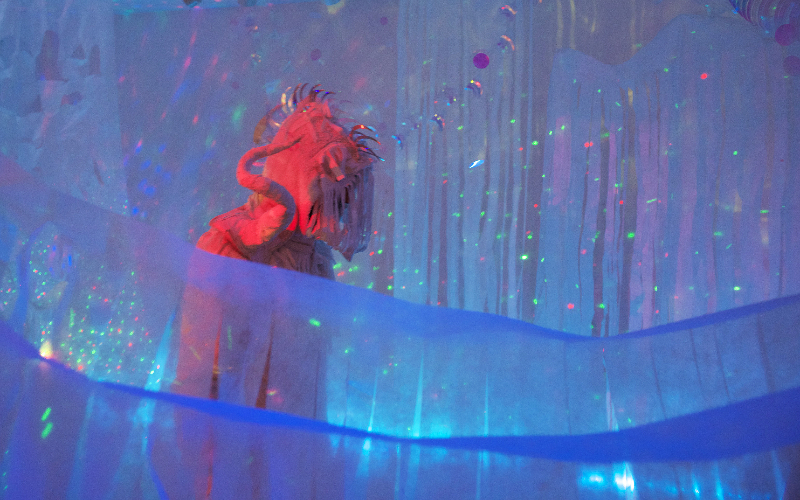 For PULP : paper art party, Bartosik, together with her dancer collaborators, Collen Snell and Rebecca A. Bobrovskis, will create this other realm/playground of paper and paper creatures in a form of a dance. Colleen Snell, who Bartosik worked with before on a project called Off the Wall is one of the founding members of Frog in Hand; a group of collaborators – dancers, fight choreographers, makeup artists, musicians, actors, spoken word poets, costume designers and visual artists who come together to create cross-disciplinary performances in unusual spaces. Bartosik was invited to participate with them as a visual artist for Canada Day in 2014. Since then, Bartosik always wanted to work with dancers, and together with the other collaborator, Bobrovskis, created improvisational dance in her studio for a video shoot. Bobrovski and Snell are both dancers and dance instructors in their own right, Bobrovski teaching in Toronto at Breakout Studio and part of a collective herself called Curiosity Collective. Snell is also a choreographer and actor-combatant. Bartosik is very familiar and comfortable with quick deadlines and often create and assemble large projects on location within a few hours. 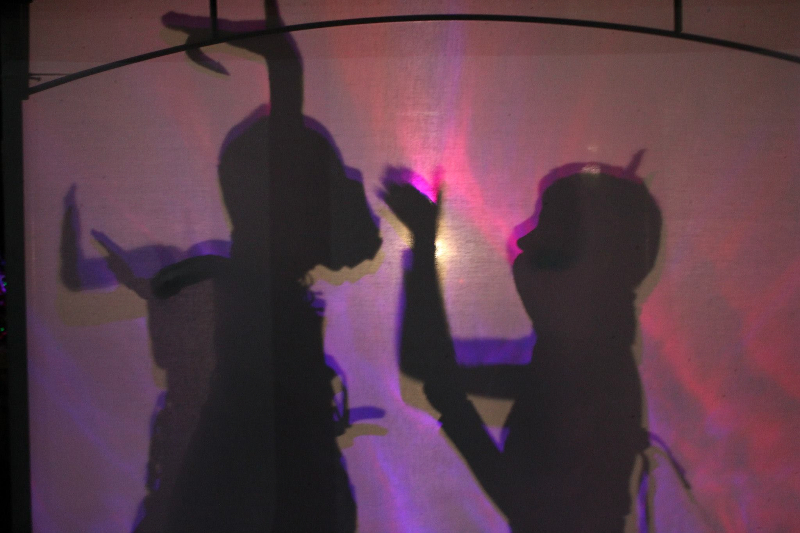 Together with her dancers, Colleen Snell and Rebecca A. Bobrovskis, she will create a paper playground of sorts in a form of a dance and art performance. 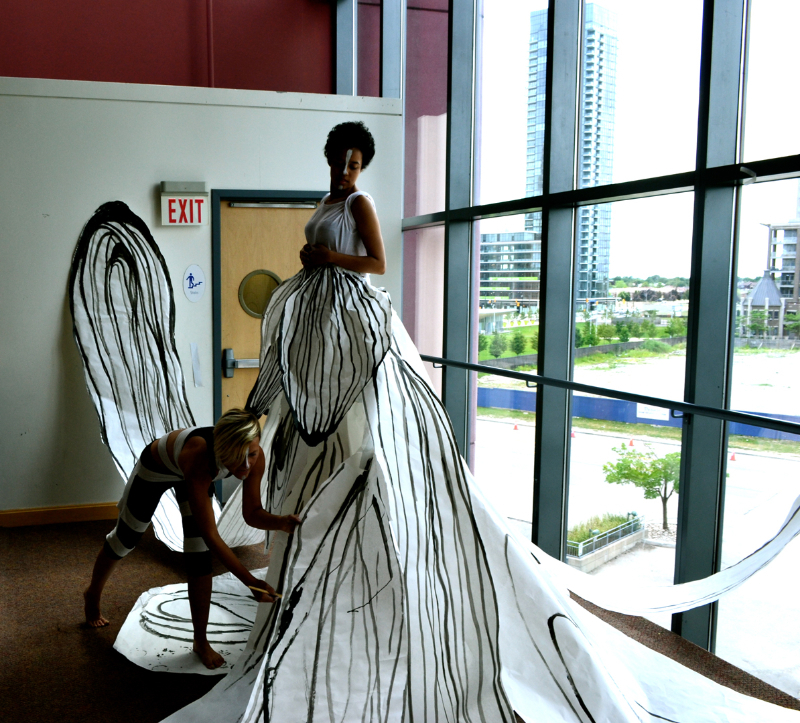 She plan to ‘create’ two paper creatures (the dancers) adorned in paper dresses that she will make on location along with a paper environment for them to dance within. The paper environment will be mostly hung using fishing wire. She is very much interested in experimenting with the sounds, rips, and, tares that the paper dresses will make while the dancers are in motion. Essentially the creatures will rip themselves out of the dresses. The idea is to do a call-and-response between the creator (Bartosik, the painter), the creatures (the dancers), the musician/musical act, and the audience. In this post are nine images that most resemble the type of project Bartosik, Snell and Bobrivskis will do for PULP : paper art party, first four being closest to the project being proposed. The rest of the images are examples of other types of work Bartosik does in a performative manner. Although Bartosik does numerous art performances and collaborations with other artists, her art practise mostly revolves around figurative painting and drawing, exhibiting nationally and internationally. She has an upcoming solo exhibition in June in Ottawa’s La Petite Mort Gallery You can find Bartosik teaching painting, drawing, and street art classes at the Art Gallery of Ontario in Toronto! 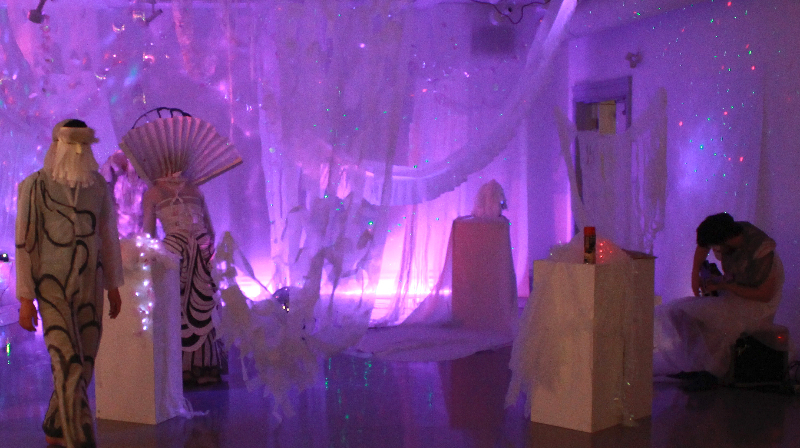 To see more installations coming to PULP: paper art party 2015 please visit our Art page. We will update with more installations every few days.